At least that's the theory of a group of researchers at the University of California, Berkeley, who looked at how wildlife loss affects conflict in places where people depend on wildlife to survive. 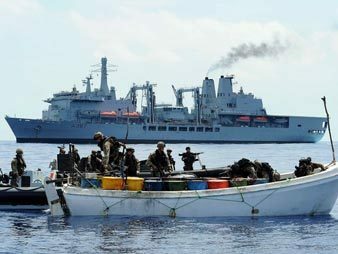 British Royal Marines board a Somali boat used by pirates off the Horn of Africa. Piracy in the area began after Somalia's regulation of its fishery collapsed. Photo courtesy of the U.K. Ministry of Defence. Climate change would affect not just wildlife but other food sources, as well. "Really, the most important consequence [of climate change] is going to be unrest and conflict between billions of people when their crops won't grow," said Brashares, envisioning a worst-case scenario. U.S. 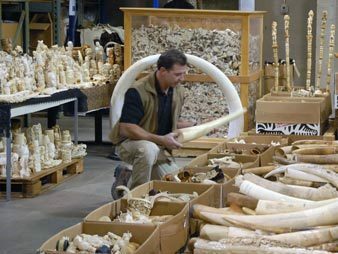 Fish and Wildlife Service agents examine a collection of ivory smuggled into U.S. ports as illegal elephant slaughter in Africa reaches record-high levels. Photo courtesy of Gavin Shire/FWS. Limited supply and high demand have driven the price of ivory, made from elephant tusks, up to $3,000 per kilogram (roughly $1,400 per pound). Rhino horns are worth $60,000 per kilogram (about $27,300 per pound) to $100,000 per kilogram (about $45,500 per pound). Jorge Rios, the chief of the Sustainable Livelihood Unit of the U.N. Office on Drugs and Crime (UNODC), emphasized the importance of being tough on poaching. His program works with governments to create stricter penalties for poaching and trafficking wildlife, and helps enforce those laws. However, he agreed that in order to be effective, anti-poaching efforts must take a three-pronged approach that addresses demand for things like ivory and rhino tusks, the livelihoods of the people involved, and enforcement of the law.